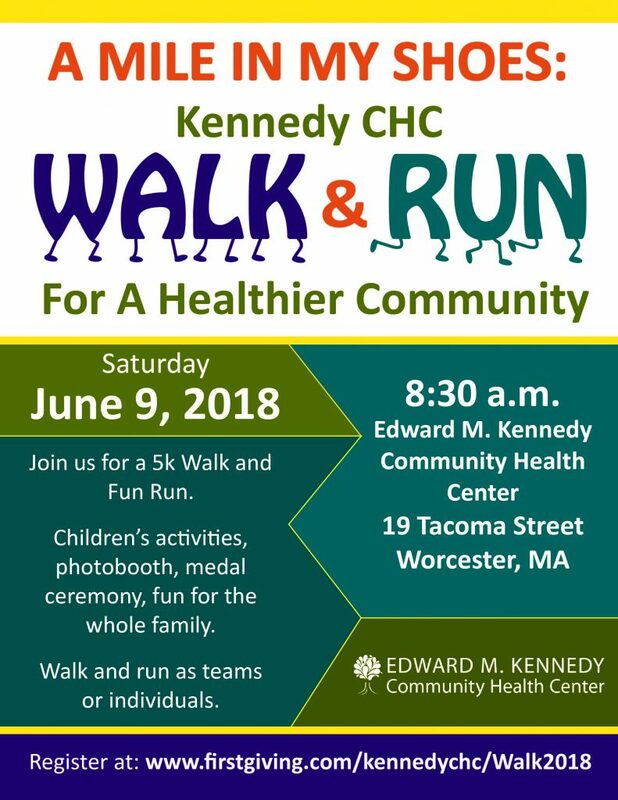 Edward M. Kennedy Community Health Center is pleased to announce that their annual walk and fun run will be held again this year on Saturday, June 9th at 8:30 AM at their 19 Tacoma Street Health Center in Worcester. In its third year, this year’s event has been expanded to include additional free family-friendly activities and a fun run component. The event will kick off at 8:30 AM and include a bounce house for the children, an appearance from the ever popular Paw Patrol character, Chase, free books, face painting, henna, and an arts and crafts section. The Regional Environmental Council will be attending with their Mobile Market for event attendees, giving Tacoma Street an early taste of their mobile farmers’ market season, which begins later that month with a weekly stop on Thursdays at 19 Tacoma Street. At 9 AM, runners will set off to begin the race component, while walkers will participate in a warm-up lead before setting off at 9:10 AM. Runners will be timed courtesy of local organization, Central Mass Striders, and will receive medals for the top 3 male and female finishers at the finishing ceremony. The event has received generous support from sponsors in the community, and through the generous in-kind donations from local organizations. The 2018 A Mile In My Shoes: Walk & Run for a Healthier Community lead sponsors are United Healthcare Community Plan and Vibram. Additional sponsors for this year’s event are as follows: Akuity Technologies, Cornerstone Bank, Magellan Health, DAI Architects, Tufts Health Plan, CBS-Xerox, Reliant Medical Group, and Harvard Pilgrim Health Care. In-kind support has been received from Sneakerama, Polar Beverages, and Wegmans. Registration for the walk and run components is live and available online at: www.firstgiving.com/kennedychc/Walk2018. Fees are $5 for walkers, $10 for runners, and it is free for patients. Registration includes a free, limited-edition tee shirt and goodie bag from sponsors. Children’s activities are free and do not require registration. All proceeds generated will be invested back into the programs and services offered by Edward M. Kennedy Community Health Center to help build a healthier community.